Virginia’s Kyle Guy hit three of the biggest free throws in college basketball history Saturday. The junior guard calmly toed the line with 0.6 seconds remaining and his Cavaliers trailing Auburn, 62-60 with a trip to the national championship on the line. He sank the first two. Auburn called a timeout to ice him. 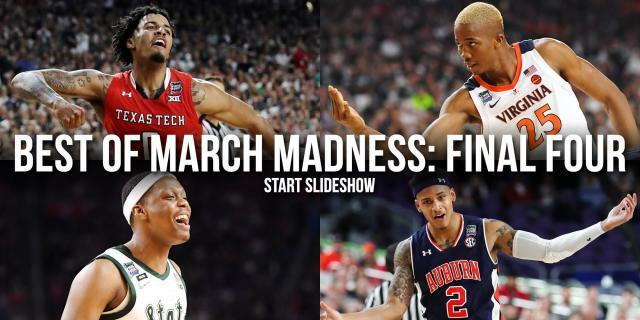 He walked back to the line to hit the final free throw that proved to be the difference in the 63-62 Virginia win when Auburn’s desperation heave failed on the other end. How Guy got to the line was a source of immediate anger from Auburn and its fans. Virginia had the ball on the sideline for an inbound pass with 1.5 seconds remaining after Bryce Brown fouled Ty Jerome near halfcourt. Brown’s foul allowed the Cavaliers to set up a last-second shot to tie or win. Jerome had the ball for the inbound pass and found a cutting Guy, who broke free from a scrum in the lane and found a good look at a game-winning 3-pointer. 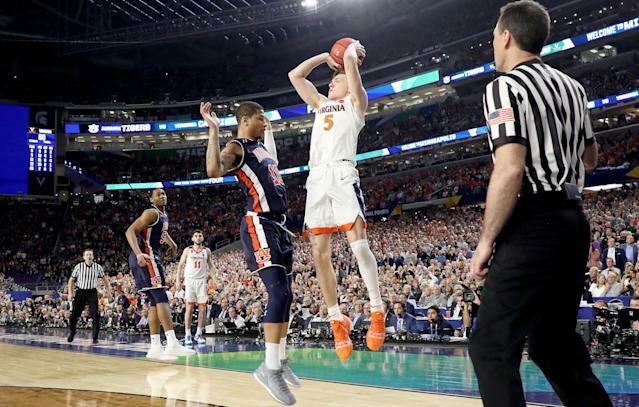 The ball clanged off the side of the rim, and the horn sounded, seemingly signaling the end of the game and another step forward in Auburn’s stunning run through the NCAA tournament. But CBS announcer Jim Nantz correctly identified a stop in the action. “Hold on. Did I hear a whistle?” Nantz said, identifying a foul called in the midst of the madness. Officials had whistled Auburn’s Samir Doughty for a shooting foul on Guy, sending him to the line for the go-ahead chance. Slow-motion replay verified to viewers that Doughty indeed jumped through Guy’s airborne legs with his body as Guy released the ball. The call and the ensuing free throws were an immediate source of outrage among Auburn and its fans. Ann Arbor News reporter Andrew Kahn reported that Auburn assistant Steven Pearl confronted officials on the court and that fans threw bottles at officials as they ran to the tunnel. Video from the stands confirmed Kahn’s report. Brown took a more nuanced approach in the postgame media session, but still wasn’t pleased. It was a raw, emotional moment for Tigers, who had just gone on a 14-0 run to take the lead in the game’s final minutes, only to see their championship hopes ripped away. But that doesn’t make it a bad call. Doughty clearly fouled Guy on that last-second shot, hitting him as he released the ball and not giving him space to land safely. It’s a brutal way to lose when the stakes are at their highest, but it doesn’t mean the officials are supposed to swallow their whistles because of the size of the moment. Auburn fans would be right to be upset over a different call in Virginia’s favor that the refs did get wrong. Officials missed a double-dribble on Jerome as he moved the ball up court in the game’s final seconds on the possession that led to the go-ahead free throws. In the end, the refs got the final call right. Virginia will play on Monday for their first national championship. And Auburn is left to digest what could have been after losing in excruciating fashion.